Barbecue and I have history. I’m not a Cincinnati native--I hail from Jackson,TN, and spent the pre Cincinnati years of my youth in Dallas, Texas, and Memphis, TN. Family visits are not complete without a visit to the local Pig N’ Whistle, and my grandparents have very emphatic opinions about dry rub vs. wet style slabs of ribs. Maybe it’s for that reason I’ve never been enthusiastic about Cincinnati style chili. It’s not that I don’t appreciate it, it’s just not in my DNA like barbecue. You can keep your cheese coney, but do not come between me and my pulled pork sandwich. Because of this, I knew it wasn’t a case of if we’d be headed up to SmoQ, but when. I first read about the newest addition to Cincinnati’s barbecue restaurant scene at the end of January on Polly’s blog. I bookmarked it for David and told him I’d like to go soon. In the last few weeks, we’ve heard nothing but great things about the restaurant (Julie called it a “trifecta of awesomeness”) and I knew we couldn’t delay any further. No more waiting. We had to go to SmoQ, I told David. I wanted barbecue, and I wanted it RFN*. We finally made it on Saturday for lunch with David’s dad, Derek. Knowing that we’d probably leave stuffed, we skipped appetizers and went straight for the entrees. Derek opted for a lighter lunch, ordering the smoQ-house salad, substituting brisket for the pulled pork. ($7.49) The brisket was excellent, smoked and flavorful, sliced against the grain to ensure tenderness. David and I tried to coordinate our sides and dishes to try the maximum amount of food at SmoQ, but there is still plenty on the menu that we’re interested in, especially the chicken. I chose the half and half ribs combo, featuring a generous half slab of baby back ribs and St. Louis Ribs ($21.99). For my sides, I picked the sweet potato brulee and baked beans. David ordered the Uncle Jerry’s shrimp and cheddar grits ($16.99) with macaroni and cheese. Our server recommended the collard greens, so he also got those. The baby backs had a nice pull to them and a delicious, sticky glaze, though I was partial to the tender St. Louis style ribs and their dry rub. I happily dug into my sweet potato brulee, which was more of a dessert than a side, and my baked beans, which were tangier than I expected and also had a little bit of pulled pork in them. We tried a little cup of the pulled pork as well (also delicious), and I’ll probably get ribs and pulled pork next time. David liked the collard greens, as well as the macaroni and cheese, though I ended up swiping his and finishing most of it off. I’m a sucker for the crunchy topping and casserole style mac. I don’t think David minded, he was too busy oohing and ahing over his shrimp and grits. Presented beautifully, the stone ground cheddar grits were creamy and delicious. David talked about them all the way home. Are we going to be back to SmoQ? Heck yes, we will. And soon! Our server must have been psychic, because she brought out diet pepsi in a carafe for quick refills. Derek goes through diet soda faster than anyone I've ever seen. David and I first discovered Mt. Carmel’s beer in our later years in college. It was the packaging that caught our eye at first. Sold in a 1/2 gallon brown glass growler, we were intrigued by its unique appearance and the fact it was a local brew. When we tried the beer itself, we were hooked. We sought it out in local groceries, enjoyed a lot of pints where we could find it on draft, and even had a “growler party” with fellow U.C. graduates after David endured a particularly brutal quarter of algebraic topology. Mt. Carmel has since upgraded to 12 ounce six-packs, which allows for wider distribution. The original line up has expanded to include seasonal beers, and more places than ever are featuring Mt. Carmel on tap. We were eager to meet Kathleen and Mike to talk about Mt. 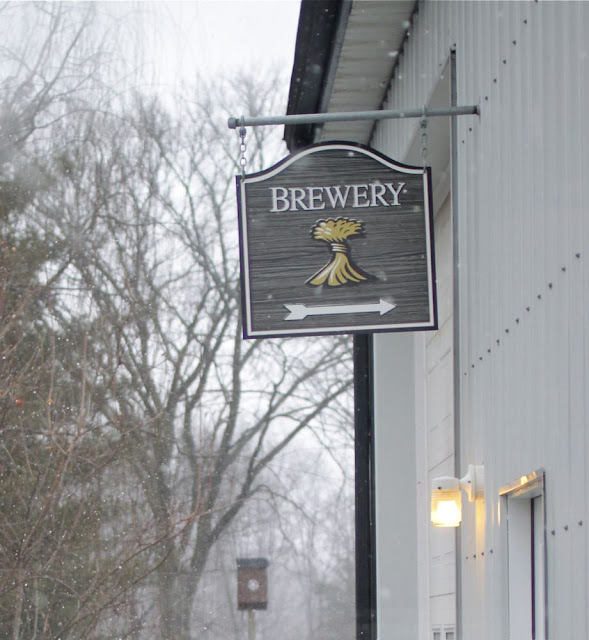 Carmel’s beginnings, current state, and what was on the horizon for the brewery. Luckily, they graciously agreed to take a few hours out of a busy brewing day to show us around the brewery. You could drive by Mt. Carmel brewing every day and not know it—unless maybe you had the windows down, and then the sweet smell of the brewing process would tell you what your eyes had missed. The large white house has been converted into a brewery and office space, and also contains the basement where Mike homebrewed Mt. Carmel’s first batches. As we entered through what used to be the children’s playroom, Kathleen explained the area will later be converted to a small tasting room. While we were able to take an inside look at the brewery, eventually brewing area will be off-limits to the public, both for production and safety reasons. How many people are working in production? Did you ever think that when you started it would get this big? The seven-barrel system that all Mt. Carmel beer is brewed on is surprisingly small for the actual volume of beer that is being produced. 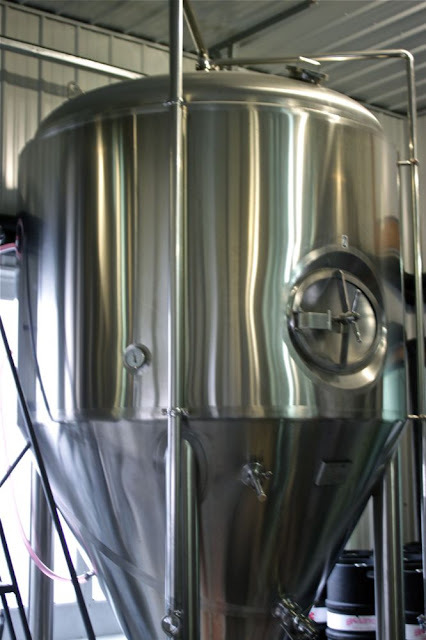 The brewery itself is very efficient and compact, and Mike, known fondly as “MikeGyver”, engineered all the plumbing and wiring to make best use of space. “We outgrew the basement within the first year. For zoning reasons, we actually had to attach the brewery onto the house.” Kathleen says with a laugh. Eventually, they plan to convert the brewing area to a 30 barrel hot house. How has the switch from growlers to bottles impacted sales? We really have enjoyed the collaboration barrel aged beers between Mt. Carmel and the Party Source—we have two Jones IPAs that are aging, and one Tripel Rot from last year—so we asked Kathleen about what’s next for the series. The next available brew is the Quaff Brother’s Figgy Pudding, which is going to be featured at this weekend’s Winter Beer Fest. Figgy Pudding is Mt. Carmel's Winter beer with fig juice added, aged in Four Roses bourbon barrels. In addition to the Quaff brothers collaboration, Mt. Carmel also brews Dewey’s pizzas seasonal beers. Nicholson’s was the first place that Mt. Carmel beer was tapped. Kathleen mentioned, showing us the article that followed shortly thereafter in the Post. What’s next for Mt. Carmel? Do you do anything with the spent grain from the brewing process? What’s the most popular seller? Mike started brewing the big, imperial beers in the basement, but Mount Carmel’s seasonal line up evolved into brewing more subtle session beers with complex flavors. With than in mind, we inquired about seeing some bigger beers from Mt. Carmel in the future. Will we see any bigger beers from Mt. Carmel soon? Mt. Carmel will be attending the Winter Beerfest this weekend, February 11th and 12th, and, in addition to bringing several of their delicious year round line up, will also be bringing the collaboration beer we spoke of earlier. Make sure to stop by their booth if you’re attending or grab a six pack at your local grocery and toast to Mt. Carmel’s continued success, and the revival of Cincinnati’s brewing history.